We have temporarily disconnected the turbine in order to calibrate the throttle. 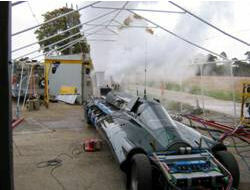 The car has two pneumatically actuated 2” steam valves that control the steam going to the exhaust and to the turbine. With the turbine disconnected we can vent steam through both valves while the car is stationary. This allows us to establish the valve travel required by the fly-by wire throttle, and the car controller. 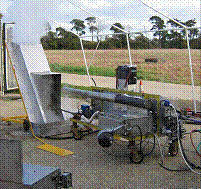 The boiler test rig, that has been housed in the test cell at Newtown Park, has been converted into a mobile unit that we can ship with us. This allows us to test individual boilers. 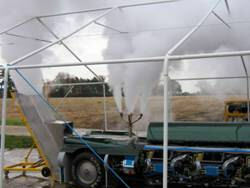 This picture shows one of the recently repaired boilers under test. The cold weather has given us a few problems with our testing. Some of the air regulator valves have been freezing; we have repositioned heat sinks to provide localised heating. We have purchased a couple of electric blankets to keep the LPG tanks warm in order to maintain the gas vapour pressure. During the past few weeks we have also managed to damage or break one of the steam control valves, an inverter, a pressure regulator, a water tank bladder and also found several faulty main gas burner solenoids. These present challenges for the testing schedule, as well as our spares provision. The car has run independently of the support rigs and once the turbine is reconnected and lagged we will be in a position to run the car first at Newton Park and then at Thorney Island, near Portsmouth. In the mean time the search goes on for a suitable venue to run the car in an FIA world record attempt.